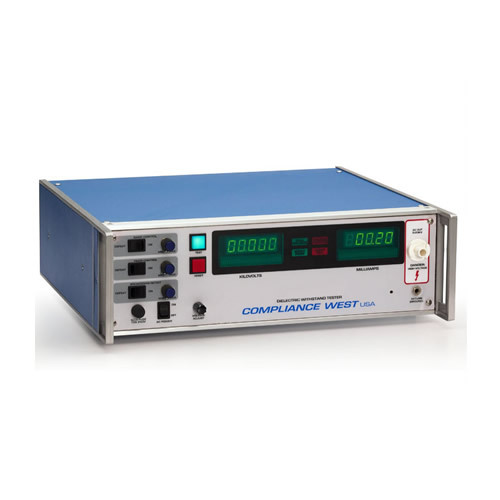 A 5000V AC/ 6000VDC hipot tester that's easy to use and priced right. Select AC or DC output via front panel button. Simple for production line personnel, easy to set up. Designed so that operator can defeat the leakage current limit and dielectric breakdown shutoffs to allow troubleshooting and analysis of problems with the DUT. Includes precision leakage current and test time setup and viewing from the LED meter. Adjustment is made with no HV output. Made in the USA. Ships with Calibration Certificate to MIL-STD 45662-A, manual and return lead. Not sure - contact us!